Oh my gosh, it has been super hot around here! All ready! It's not even quite summer yet. I'm just a wimp about heat - I think I could live in the Arctic! Well, I've certainly been staying inside, whipping up a few creative things. I've got a couple of baby cards today. First up is this fun shaker card. I decided I needed to actually use a couple of stamp sets that I've had for awhile, but hadn't even opened. Instead of just sequins, I've got some prills in there - they look like little tiny beads. Very cute and they make a lot of fun noise when the card is shook. 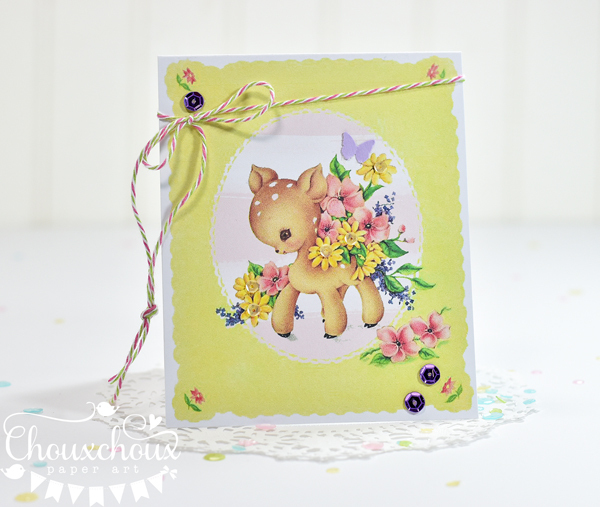 This Deer So Sweet is a printable. 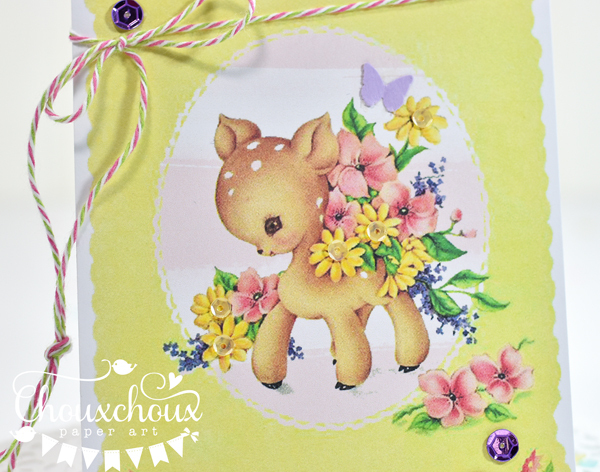 I took an old card and cleaned it up and added pink or mint watercolor stripes behind the deer and for the back of the card. You can download both colors below. Isn't that deer just adorable? The printables include a couple of bonus sentiments, too! I made this card because I needed a thank you card. Now, WHY you may ask? Why would I need a thank you for a baby gift? NEWSFLASH: I'm going to be a grandma in late October or early November!! A grandma to a little girl! Exciting, right??? 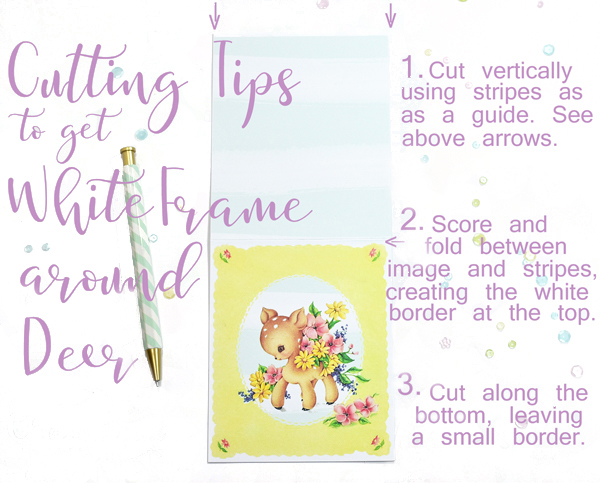 Okay, back to the deer printables. I designed the cards to have a white frame around the vintage image. These are some cutting tips to make that really easy to accomplish. Just cut right along the sides using the watercolor stripes as the guide. Score above the vintage image to make the fold - leave about the same white space above as on the sides. Cut the bottom about the same distance from the vintage image, as well. You can download the pink version HERE and the mint version HERE. When the image comes up, wait just a second and the download button will appear in the top right corner. Do you need to stay out of the heat, too? 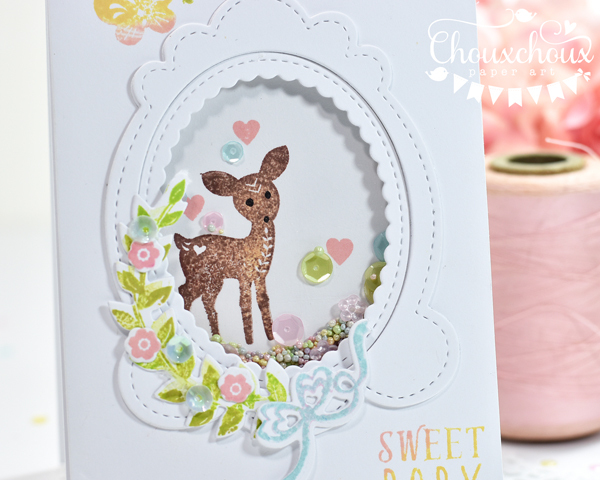 Maybe you need to make a quick, cute baby card or two? Have a wonderful week - see you again soon! Also here the summer isn't arrived.... Rain, strong wind... a bit of sun and then rain... Uff! Lovely baby cards, so sweet!! Love expecially the design of the shaker, and the little prills look so well inside! This is super adorable! I just found you from a friend who recommended your site. I joined as a follower and to receive emails. Your images are cute and love the papers. Congratulations, Lori! You must be so excited and I bet you can't wait for October/November! I love both cards! I make a lot of shakers so that one is my favourite! Thanks so much for the adorable freebies! Hurrah--oh how wonderfully exciting, Lori! Both cards are just darling! I really love the sweet shaker--may have to get some prills! Aww, how cute. So adorable Lori. Just the sweet baby cards ever, Lori!!! The deers are so cute! And, congratulations to you grandma...how exciting!!! Precious - they do remind me of cards when I was a wee one - yes I am that old! I don't know which one is my favorite! I do adore shaker cards and this one is a blue ribbon winner. But I love the yellow card and that sweet little Bambi - oh what to chose!! Write a really personal letter to go inside the yellow card. Do you know what the baby's name is yet? Make it really personal from her Grand Ma Ma and put it in her baby book. What fun - hey, my birthday is in October!! Oh my goodness.. so very sweet as always... I just LOVE your style... and the prills... awesomely pretty... LOVE! AND CONGRATULATIONS!!!! Woo hoo!! Awww these cards are so sweet Lori! 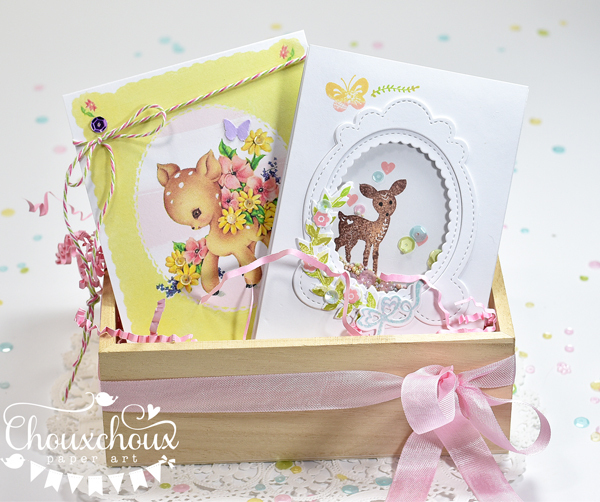 I love the frame around the first card and second baby deer is adorable! A big congrats to you too, how exciting! How cute are these! I LOVE them too!!! I have friends who are expecting and these will be wonderful!! TFS!! omgoodness, your baby cards are SO sweet!! I LOVE the little shaker card to absolute pieces! 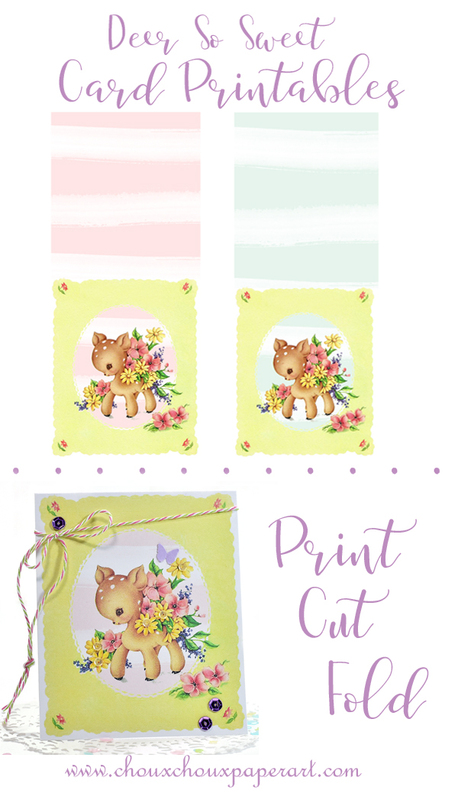 Such a fabulous scene you created with those adorable stamps, and I love the prills. And your printable deer are super sweet, too. Love the striped background! And huge congrats, Grandma!! That is SO exciting! How sweet, deer cards...love deer on anything. Congrats on becoming a grandmother. I hear it's wonderful.